Christmas has come early after Vogue gives us yet another model on the cover this year. First there was the spectacular three-model cover from September and now to our amazement, Natalia Vodianova graces the November issue wearing an intricate piece from Chanel’s resort collection. Annie Leibovitz shot the Russian beauty at the Palais Garnier in Paris alongside Natalie Portman’s husband, Benjamin Millepied. Natalia is no stranger to fronting American Vogue alone, covering the July issue back in 2007. Members of our forums are naturally ecstatic to see a model on Vogue‘s cover. “No way!! Another model on the cover of US Vogue? What is happening to this world?” questioned an elated Oxymore. “I can’t believe they’re having a model on the cover again; it’s so exciting! Natalia is such a force!” raved Nepenthes. “Wow. This is definitely shocking! I’m not a massive Natalia fan – she’s hit or miss for me – but I think she looks beautiful here and I’m extremely happy to see a model on the cover of US Vogue. I bet it’ll look fantastic on the newsstands,” enthused a surprised happycanadian. Yet when the excitement died down, forum members began to pick faults with the cover image. “While I applaud having a model on the cover, especially OG. 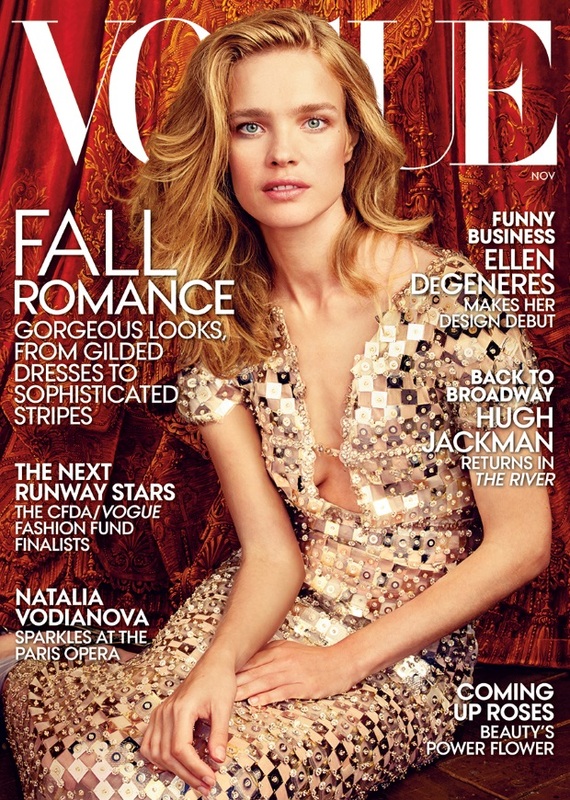 Vodianova, just like on Vanity Fair, doesn’t sell this to me. It’s not [an] exciting cover image,” shared an underwhelmed Miss Dalloway. “Is it a bad light or too much Photoshop? Natalia’s face doesn’t look okay. And I don’t like this color of her hair.. It’s so cheap,” disapproved narcyza. So, there we have it. Models don’t always make for the best magazine covers. See inside the thread for Natalia’s cover story as well as some of the fashion content. Don’t forget to add your own two cents here, too.